Multiplexed diffraction gratings were recorded in 300 μm thick layers of biophotopol photopolymer by using two peristrophic multiplexing schemes separately and in combination. In addition, it was shown that riboflavin may be used as polymer initiator in acrylamide photopolymer films and the holographic properties of these films such as diffraction efficiency and dynamic range were compared with those of the biophotopol photopolymer. A variable exposure scheduling method was adopted to store the gratings using a 488 nm Ar laser. Thirteen nearly uniform sinusoidal wave gratings could be recorded in a low toxicity recording medium with a variable exposure energy scheduling method. The diffraction efficiency and dynamic range obtained using the two multiplexing schemes were compared. H. Ruan, “Recent advances in holographic data storage,” Front. Optoelectron. 7(4), 450–466 (2014). K. Anderson, M. Ayres, F. Askham, and B. Sissom, “Holographic data storage: Science fiction or science fact?” Proc. SPIE 9201, 920102 (2014). J. Marín-Sáez, J. Atencia, D. Chemisana, and M.-V. Collados, “Characterization of volume holographic optical elements recorded in Bayfol HX photopolymer for solar photovoltaic applications,” Opt. Express 24(6), A720–A730 (2016). M. V. Collados, D. Chemisana, and J. Atencia, “Holographic solar energy systems: The role of optical elements,” Renew. Sustain. Energy Rev. 59, 130–140 (2016). F.-K. Bruder, H. Bang, T. Fäcke, R. Hagen, D. Hönel, E. Orselli, C. Rewitz, T. Rölle, D. Vukicevic, and G. Walze, “Precision holographic optical elements in Bayfol HX photopolymer,” Proc. SPIE 9771, 977103 (2016). N. K. Mohan, Q. T. Islam, and P. K. Rastogi, “Recent developments in holographic optical elements (HOEs),” Opt. Lasers Eng. 44, 871–880 (2006). A. Olivares-Pérez, M. P. Hernández-Garay, I. Fuentes-Tapia, and J. C. Ibarra-Torres, “Holograms in polyvinyl alcohol photosensitized with CuCl22H2O,” Opt. Eng. 50(6), 065801 (2011). D. Cody, I. Naydenova, and E. Mihaylova, “New non-toxic holographic photopolymer material,” J. Opt. 14(1), 015601 (2012). D. Cody, S. Gribbin, E. Mihaylova, and I. Naydenova, “Low-Toxicity Photopolymer for Reflection Holography,” ACS Appl. Mater. Interfaces 8(28), 18481–18487 (2016). M. Ortuño, S. Gallego, A. Márquez, C. Neipp, I. Pascual, and A. Beléndez, “Biophotopol: A Sustainable Photopolymer for Holographic Data Storage Applications,” Materials (Basel) 5(12), 772–783 (2012). V. Navarro-Fuster, M. Ortuño, S. Gallego, A. Márquez, A. Beléndez, and I. Pascual, “Biophotopol’s energetic sensitivity improved in 300 μm layers by tuning the recording wavelength,” Opt. Mater. 52, 111–115 (2016). N. Beztsinna, M. Solé, N. Taib, and I. Bestel, “Bioengineered riboflavin in nanotechnology,” Biomaterials 80, 121–133 (2016). 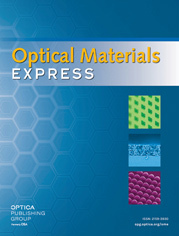 H. J. Coufal, D. Psaltis, and G. T. Sincerbox, Holographic Data Storage, Springer Series in Optical Sciences (Springer, 2000), Vol. 76. S. Gallego, C. Neipp, M. Ortuño, E. Fernández, A. Beléndez, and I. Pascual, “Analysis of multiplexed holograms stored in a thick PVA/AA photopolymer,” Opt. Commun. 281(6), 1480–1485 (2008). M. Ortuño, A. Márquez, E. Fernández, S. Gallego, A. Beléndez, and I. Pascual, “Hologram multiplexing in acrylamide hydrophilic photopolymers,” Opt. Commun. 281(6), 1354–1357 (2008). Y. Qi, H. Li, J. Guo, M. R. Gleeson, and J. T. Sheridan, “Material response of photopolymer containing four different photosensitizers,” Opt. Commun. 320, 114–124 (2014). K. Osabe and H. Saito, “Stability of holographic gratings recorded on photopolymer films using acrylamide as monomer and N,N′-methylenebisacrylamide,” Proc. SPIE 9386, 93860Q (2015). F. Zhai, Y. Hao, and K. Yang, “Improving the holographic performance of photopolymers for holographic recording application,” Optik (Stuttg.) 126(23), 4304–4307 (2015). Y. Li, C. Wang, H. Li, X. Wang, J. Han, and M. Huang, “Effect of incorporation of different modified Al2O3 nanoparticles on holographic characteristics of PVA/AA photopolymer composites,” Appl. Opt. 54(33), 9799–9802 (2015). S. Hosam, N. Izabela, M. Suzanne, M. Colm, and T. Vincent, “Characterization of an acrylamide-based photopolymer for data storage utilizing holographic angular multiplexing,” J. Opt. A, Pure Appl. Opt. 7(5), 255–260 (2005). M. Ortuño, S. Gallego, C. García, C. Neipp, A. Beléndez, and I. Pascual, “Optimization of a 1 mm thick PVA/acrylamide recording material to obtain holographic memories: method of preparation and holographic properties,” Appl. Phys. B 76(8), 851–857 (2003). V. Pramitha, R. Joseph, K. Sreekumar, and C. S. Kartha, “Peristrophic multiplexing studies in silver doped photopolymer film,” J. Mod. Opt. 57(10), 908–913 (2010). E. Fernández, M. Ortuño, S. Gallego, C. García, A. Beléndez, and I. Pascual, “Comparison of peristrophic multiplexing and a combination of angular and peristrophic holographic multiplexing in a thick PVA/acrylamide photopolymer for data storage,” Appl. Opt. 46(22), 5368–5373 (2007). A. Pu, K. Curtis, and D. Psaltis, “Exposure schedule for multiplexing holograms in photopolymer films,” Opt. Eng. 35(10), 2824–2829 (1996). M. Ortuño, E. Fernández, S. Gallego, A. Beléndez, and I. Pascual, “New photopolymer holographic recording material with sustainable design,” Opt. Express 15(19), 12425–12435 (2007). E. Fernández, R. Fuentes, M. Ortuño, A. Beléndez, and I. Pascual, “Holographic grating stability: influence of 4,4′-azobis (4-cyanopentanoic acid) on various spatial frequencies,” Appl. Opt. 52(25), 6322–6331 (2013). R. Fernández, S. Gallego, V. Navarro-Fuster, C. Neipp, J. Francés, S. Fenoll, I. Pascual, and A. Beléndez, “Dimensional changes in slanted diffraction gratings recorded in photopolymers,” Opt. Mater. Express 6(11), 3455–3468 (2016). F. T. O’Neill, J. R. Lawrence, and J. T. Sheridan, “Thickness variation of self-processing acrylamide-based photopolymer and reflection holography,” Opt. Eng. 40(4), 533–539 (2001). Fig. 1 Scheme of the two independent multiplexing motions. Fig. 2 Transmittance spectra (T) of the unexposed RF (solid blue line) and YE (discontinuous red line) photopolymer dyes (a) and absorption coefficient spectra of RF (b). Fig. 3 Diffraction efficiency normalized to the incident intensity (DED/I) (a) and diffraction efficiency normalized to diffracted + transmitted intensities (DED/(D + T)) (b); DE (solid symbols) and DE + TE (hollow symbols) versus exposure energy (E) for both photopolymers (NaAO; blue and AA; red). Fig. 4 Diffraction efficiency normalized to the incident intensity (DED/I) (a) and diffraction efficiency normalized to diffracted plus transmitted intensities (DED/(D + T)) (b); DE (hollow symbols) versus angular scan around the first Bragg angle (θ1) for both photopolymers (NaAO; blue and AA; red). We have also included the fitting curves to the Kogelnik’s equation (Eq. (2)) for both photopolymers. Fig. 5 Diffraction efficiency (DE) versus angular scan (θ1) of thirteen angle-multiplexed volume holograms. Fig. 6 Diffraction efficiency (DE) versus angle of reconstruction Y axis (θ1) for a) AA and b) NaAO samples for different θ2 angles along the Z axis. Fig. 7 Grating diffraction efficiency (DE) versus Y and Z axes (θ1 and θ2, respectively). Fig. 8 Angular reconstruction of multiplexed gratings along the Y axis (θ1) at different times (t). Fig. 9 Maximum diffraction efficiency (DEm) versus reconstruction time (t) for each grating. Fig. 10 Angle shift of the maximum DE versus reconstruction time (t) for each grating. Fig. 11 Photograph of an uncured recorded sample with (a) one unslanted grating and (b) thirteen multiplexed gratings along the Y axis and a cured recorded sample with (c) one unslanted grating and (d) thirteen multiplexed gratings along the Z axis. Table 1 Molarity composition of each photopolymer solution. PVA in percentage. Table 2 Main holographic parameters of the samples shown in Fig. 4. Table 3 Parameters for 13 multiplexed gratings recorded with an axis parallel to the sample for NaAO and AA samples. Table 4 Parameters for 13 multiplexed gratings recorded with the axis perpendicular to the sample for NaAO and AA samples. Table 5 Parameters of 20 multiplexed gratings recorded with a combination of perpendicular and parallel axes. Molarity composition of each photopolymer solution. PVA in percentage. Main holographic parameters of the samples shown in Fig. 4. Parameters for 13 multiplexed gratings recorded with an axis parallel to the sample for NaAO and AA samples. Parameters for 13 multiplexed gratings recorded with the axis perpendicular to the sample for NaAO and AA samples. Parameters of 20 multiplexed gratings recorded with a combination of perpendicular and parallel axes.